Comment: City Hall on the left still stands today. The old Marquette Post Office on the right was demolished in 1936, to make room for the new and current post office that was occupied in 1937. Comment: Marquette Township. Originally established in HOUGHTON COUNTY as CARP RIVER on January 12, 1847 with William B. McNair as the first postmaster. Changed to MARQUETTE COUNTY on June 29, 1848. The CARP RIVER Post Office discontinued operation on April 2, 1851 and was re-established on October 13, 1851 with Peter White as postmaster. 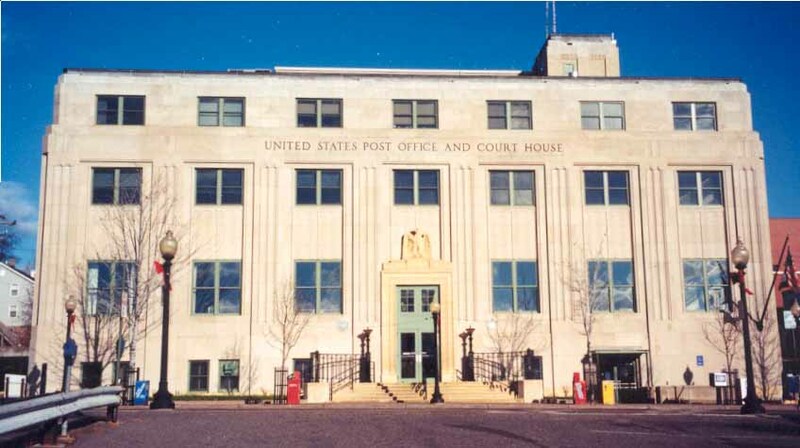 On April 17, 1856 is was changed to MARQUETTE #2 Post Office and is currently an active post office today. The WORCHESTER Post Office was established on September 14, 1849 with Amos Rogers Harlow as its first postmaster. On August 21, 1850, the WORCHESTER Post Office became the MARQUETTE #1 Post Office (named in honor of Jacques Marquette, the french Jesuit missionary) and discontinued operation on August 16, 1852. The CARP RIVER Post Office and the WORCHESTER Post Office were in direct competetion at the same time. 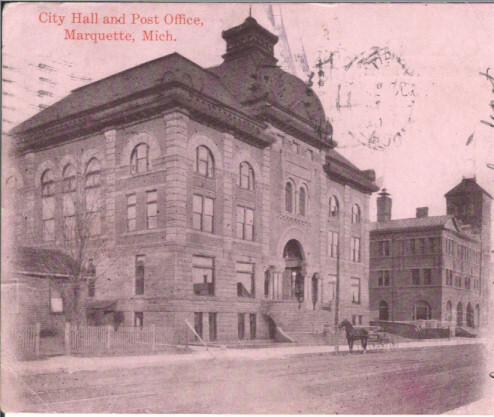 IMPORTANT HISTORICAL FACTS: The old Marquette, MI Post Office and Custom House pictured was built at a cost of over $81,000 and construction was completed in 1889. It was located at the corner of West Washington and North Third Streets in Marquette. The last day at this post office building was February 1, 1936. This building was demolished in February 1936 to make way for the new Post Office and Court House at this same location. 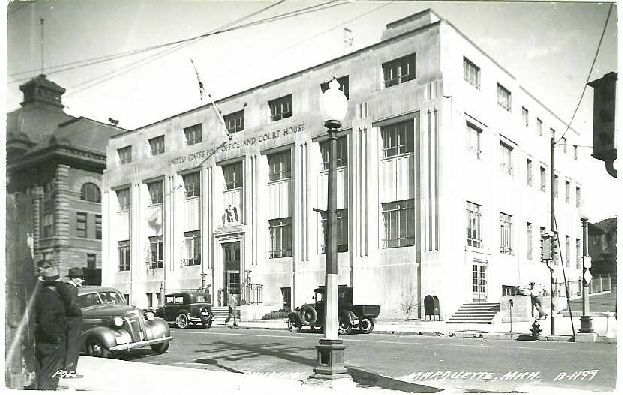 The Official Opening of the new Marquette Post Office and Court House took place on April 10, 1937. 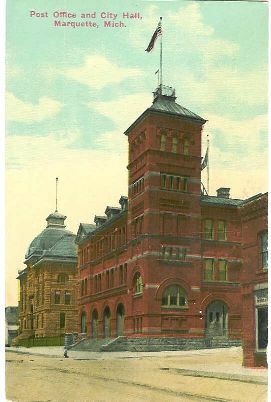 City Hall which is pictured to the left, is still standing today next to the new post office and court house. Comment: Mural in the lobby of the Marquette, MI Post Office, "Marquette Exploring Shores of Lake Superior" by Dewey Albinson (1938).